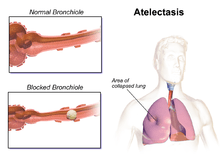 Atelectasis is the collapse or closure of a lung resulting in reduced or absent gas exchange. It may affect part or all of a lung. It is usually not bilateral. It is a condition where the alveoli are deflated down to little or no volume, as distinct from pulmonary consolidation, in which they are filled with liquid. It is often called a collapsed lung, although that term may also refer to pneumothorax. It is a very common finding in chest x-rays and other radiological studies. It may be caused by normal exhalation or by several medical conditions. Although frequently described as a collapse of lung tissue, atelectasis is not synonymous with a pneumothorax, which is a more specific condition that features atelectasis. Acute atelectasis may occur as a post-operative complication or as a result of surfactant deficiency. In premature neonates, this leads to infant respiratory distress syndrome. It is a common misconception that atelectasis causes fever. A study of 100 post-op patients followed with serial chest X-rays and temperature measurements showed that the incidence of fever decreased as the incidence of atelectasis increased. A recent review article summarizing the available published evidence on the association between atelectasis and post-op fever concluded that there is no clinical evidence supporting this doctrine. The most common cause is post-surgical atelectasis, characterized by splinting, i.e. restricted breathing after abdominal surgery. Other most common cause is pulmonary Koch. Smokers and the elderly are at an increased risk. Outside of this context, atelectasis implies some blockage of a bronchiole or bronchus, which can be within the airway (foreign body, mucus plug), from the wall (tumor, usually squamous cell carcinoma) or compressing from the outside (tumor, lymph node, tubercle). Another cause is poor surfactant spreading during inspiration, causing the surface tension to be at its highest which tends to collapse smaller alveoli. Atelectasis may also occur during suction, as along with sputum, air is withdrawn from the lungs. There are several types of atelectasis according to their underlying mechanisms or the distribution of alveolar collapse; resorption, compression, microatelectasis and contraction atelectasis. Post-surgical atelectasis will be bibasal in pattern. Atelectasis may be an acute or chronic condition. In acute atelectasis, the lung has recently collapsed and is primarily notable only for airlessness. In chronic atelectasis, the affected area is often characterized by a complex mixture of airlessness, infection, widening of the bronchi (bronchiectasis), destruction, and scarring (fibrosis). Chronic atelectasis may take one of two forms—middle lobe syndrome or rounded atelectasis. 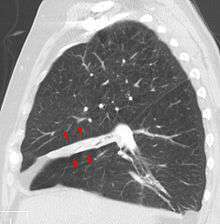 In right middle lobe syndrome, the middle lobe of the right lung contracts, usually because of pressure on the bronchus from enlarged lymph glands and occasionally a tumor. The blocked, contracted lung may develop pneumonia that fails to resolve completely and leads to chronic inflammation, scarring, and bronchiectasis. In rounded atelectasis (folded lung syndrome), an outer portion of the lung slowly collapses as a result of scarring and shrinkage of the membrane layers covering the lungs (pleura). This produces a rounded appearance on x-ray that doctors may mistake for a tumor. 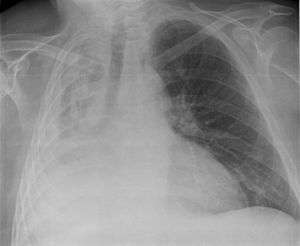 Rounded atelectasis is usually a complication of asbestos-induced disease of the pleura, but it may also result from other types of chronic scarring and thickening of the pleura. The atmosphere is composed of 78% nitrogen and 21% oxygen. Since oxygen is exchanged at the alveoli-capillary membrane, nitrogen is a major component for the alveoli's state of inflation. If a large volume of nitrogen in the lungs is replaced with oxygen, the oxygen may subsequently be absorbed into the blood, reducing the volume of the alveoli, resulting in a form of alveolar collapse known as absorption atelectasis. It is usually associated with accumulation of blood, fluid, or air within the pleural cavity, which mechanically collapses the lung. This is a frequent occurrence with pleural effusion, caused by congestive heart failure (CHF). Leakage of air into the pleural cavity (pneumothorax) also leads to compression atelectasis. Treatment is directed at correcting the underlying cause. Post-surgical atelectasis is treated by physiotherapy, focusing on deep breathing and encouraging coughing. An incentive spirometer is often used as part of the breathing exercises. Walking is also highly encouraged to improve lung inflation. People with chest deformities or neurologic conditions that cause shallow breathing for long periods may benefit from mechanical devices that assist their breathing. One method is continuous positive airway pressure, which delivers pressurized air or oxygen through a nose or face mask to help ensure that the alveoli do not collapse, even at the end of a breath. This is helpful, as partially inflated alveoli can be expanded more easily than collapsed alveoli. Sometimes additional respiratory support is needed with a mechanical ventilator. The primary treatment for acute massive atelectasis is correction of the underlying cause. A blockage that cannot be removed by coughing or by suctioning the airways often can be removed by bronchoscopy. Antibiotics are given for an infection. Chronic atelectasis is often treated with antibiotics because infection is almost inevitable. In certain cases, the affected part of the lung may be surgically removed when recurring or chronic infections become disabling or bleeding is significant. If a tumor is blocking the airway, relieving the obstruction by surgery, radiation therapy, chemotherapy, or laser therapy may prevent atelectasis from progressing and recurrent obstructive pneumonia from developing. The word atelectasis /ˌætᵻˈlɛktəsᵻs/ uses combining forms of atel- + ectasis, from Greek: ἀτελής, "incomplete" + ἔκτασις, "extension"). Tympanic membrane atelectasis: Retraction of the ear drum into the middle ear can also be referred to as atelectasis. ↑ Wedding, Mary Ellen; Gylys, Barbara A. (2005). Medical Terminology Systems: A Body Systems Approach: A Body Systems Approach. Philadelphia, Pa: F. A. Davis Company. ISBN 0-8036-1289-3. ↑ Orenstein, David M. (2004). Cystic Fibrosis: A Guide for Patient and Family. Lippincott Williams & Wilkins. p. 62. ISBN 9780781741521. ↑ Engoren M (January 1995). "Lack of association between atelectasis and fever". Chest. 107 (1): 81–4. doi:10.1378/chest.107.1.81. PMID 7813318. ↑ Mavros MN, Velmahos GC, Falagas ME (2011). "Atelectasis as a cause of postoperative fever: where is the clinical evidence?". Chest. 140 (2): 418–24. doi:10.1378/chest.11-0127. PMID 21527508. ↑ White, Gary C. (2002). Basic Clinical Lab Competencies for Respiratory Care, 4th ed. Delmar Cengage Learning. p. 230. ISBN 978-0-7668-2532-1. ↑ Robbins (2013). Basic Pathology. ELSEVIER.